LOUISVILLE, Ky. — Is technology in the trucking industry moving too fast for the men and women who sit behind the wheel of big rigs? That was a concern voiced by a number of truck drivers attending a March 29 session at the 2019 Mid-America Trucking Show. 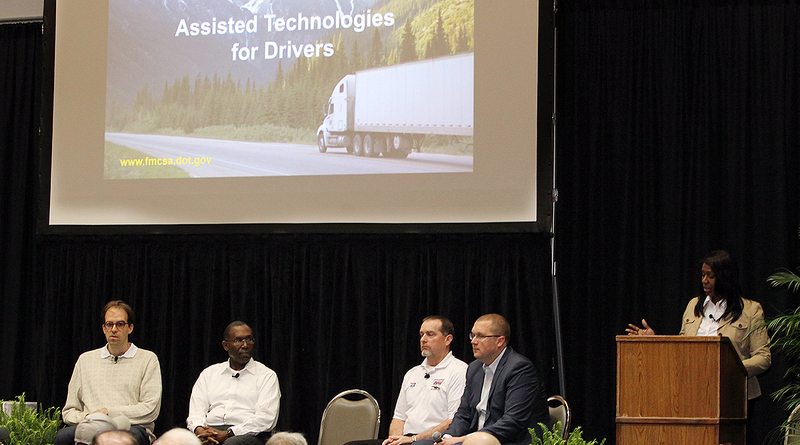 The drivers’ questions and comments seemed to keep a panel of executives touting the promise of driver-assist technologies and autonomous trucks on their heels. The primary concern expressed by drivers attending the session centered on how soon they would be replaced by “robot trucks.” But there also were questions about how to disable driver-assist in certain situations, and how soon the technologies would be mandated by federal regulators. “I think like everyone else that as long as there are trucks, there are going to be truck drivers,” said Ognen Stojanovski, CEO of San Franciso-based Pronto, a company that makes driver-assist technologies. However, he said trucks with assist technologies can help a driver see and react fast, but they don’t have the instincts that drivers have. The development of the driver-assist technologies will not happen like “turning on a light switch,” they will be “evolutionary,” Stojanovski said. It wasn’t all good, but lane departure warning systems, which he said were annoying in the 2014 model truck he once drove, have vastly improved in the new 2019 model he’s now driving. Still, he said he’s not convinced there will ever be a truck that can travel across the country without somebody in it. He also said he’s not concerned that technology will ever replace him. Larry Minor, the Federal Motor Carrier Safety Administration’s associate administrator for policy, said his agency has worked on a number of driver-assist technologies to remove regulatory obstacles that can improve safety for drivers. For example, he said the agency removed a long-standing regulation that prohibited putting lane departure sensors on tractor windshields after the systems were tested for safety, and only recently, FMCSA also gave the go-ahead to substitute cameras for conventional mirrors because they improved visibility.